Import contacts straight from your Gmail inbox into HubSpot. Contacts will be created in HubSpot with the name (if available) and email address on their corresponding Gmail contact. If you don't have a Gmail account connected to HubSpot, the option will be grayed out. Click Connect your Gmail account to connect your Gmail account to HubSpot before continuing the import process. Click the Select Gmail account dropdown menu to select the Gmail account you want to import contacts from. In the Domains Allowed section, select if you want to import All contacts, or All contacts excluding those with the following domain(s). To exclude contacts with a certain domain, enter the domain in the text field and click Add. This option is useful if you want to exclude internal contacts, or contacts at specific companies. Enter an Import Name, then click Next. 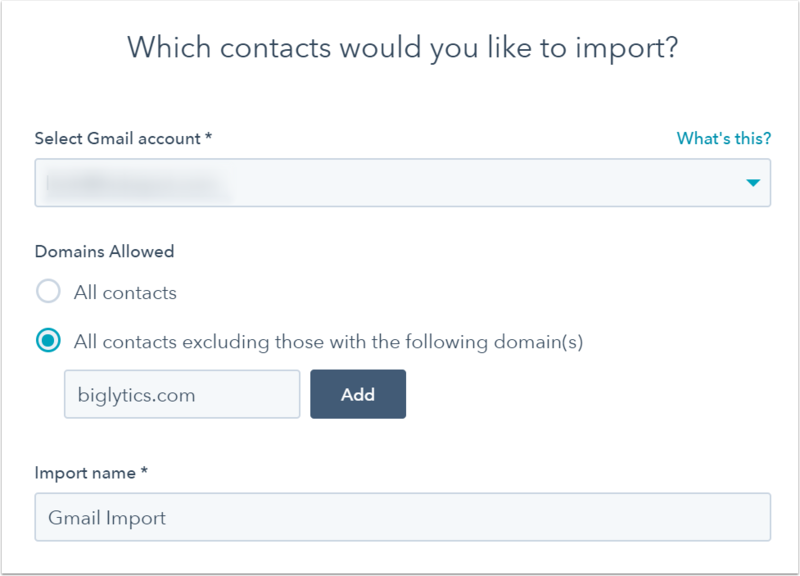 Confirm your import by reviewing the email addresses of the contacts that will be imported into HubSpot. When you're done, click Begin import.